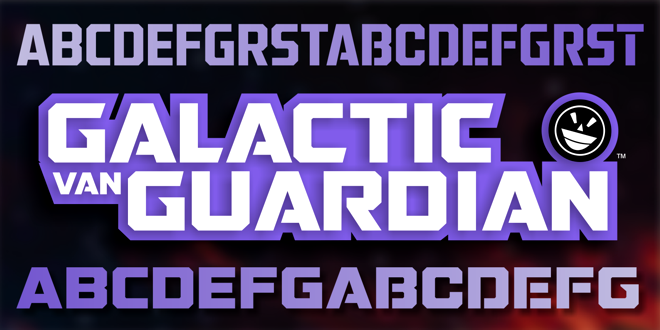 GALACTIC VANGUARDIAN with UNIVERSAL LICENSE* is a 3-font family complete with lowercase-accessible alt-CAP characters, extended ranges and complete keyboard support. OpenType replacements and true lowercase ranges are also accessible via your software's OpenType options panel or character map. If you enjoyed the freebie version that brought you to this page, you're going to love the full commercial version of GVG and its supporting light-weight accomplice with all of their fun extras! Payment is via secure PayPal link. No PayPal? You'll find a PayPal-supported option to pay by credit card when you click the BUY NOW link. Fonts arrive via zip file. Simply download, extract and enjoy! *UNIVERSAL END-USER LICENSE allows use for same usage applications as Standard license: desktop publishing, logo design, web font, graphic design, signage, screen printing, etc. ; but it also allows for distribution via software, games, apps, OEM, ebook, interactive text applications, etc. Visit our website by clicking The Fontry at the top of this description, or use the link below to learn more about the Galactic VanGuardian font family.